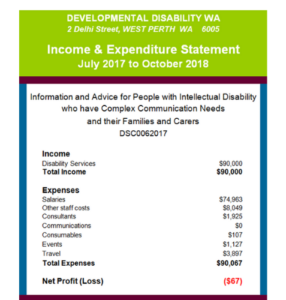 ILC 2016/17 Priority One: Information and advice for People with Intellectual Disability who have Complex Communication Needs and their Families and Carers. Individuals with an intellectual disability diagnosis, unmet complex communication needs (i.e. no robust communication system in place) and behaviours which can be seen as challenging are cited as some of the most difficult to include in NDIS planning. This project aimed to bridge the gap in awareness and information about the NDIS by developing accessible information targeted to the needs of this group. Survey: Complex Communication Needs and the NDIS; 106 respondents. Use of Augmentative and Alternative Communication (ACC) systems: Whilst 87% were aware that anybody can communicate, regardless of severity of disability, a different story was communicated during workshops, with many families believing and having been told by professionals that their family member could not use a communication system. 65% of participants reported having a communication system with most feeling that with the right support, using the system achieved a positive result. Planning, goal setting and NDIS specific language in communication systems: To engage directly in their NDIS plan, participants need access to explicit vocabulary in their AAC system such as ‘NDIS’, ‘plan’, ‘planner’, ‘goal’ etc. 93% of respondents said there was no NDIS specific language in their AAC system. 49% reported that their AAC user was not able to contribute to their NDIS plan at all, and 45% felt that they could contribute to some degree. A wide range of people can be said to have CCN, including people who appear to be able to speak but who cannot necessarily say what they want to express or process language. Unmet communication needs affect physical and mental health, quality of life and level of vulnerability, and increase the incidence of behaviours which can be seen as challenging. The target group are likely to have experienced outdated therapy approaches of working with the individual as opposed to contemporary approaches of working with their family, supporters and community to support them to become ‘smart communication partners’. For this group the pressures of being expected to ‘perform’ with an AAC device can result in disengagement. There are unhelpful assumptions made about the capacity of people who cannot speak – these people are consistently under-estimated. There are unhelpful assumptions made about the capacity of people who can speak – these people are consistently over-estimated and frequently miss out on communication supports. There are many attitudinal barriers to people accessing communication support including beliefs like the level of severity of disability affecting potential. Whilst best practice for anyone, this target group has a high level of need for person centred approaches to communication support which consults with them on their preferences and starts from a point of believing in their capacity and potential. 3. Workshops: Six (6) x NDIS Planning for People who are Non Verbal and have Developmental Disability workshops were scheduled, with a total of 91 attendees, in the following locations: Bassendean (13 March 2018), Bridgetown (3 May 2018), Tom Price (18 May 2018-cancelled), Mandurah (6 June 2018), Bunbury (13 June 2018), Fremantle (19 June 2018). Pre and Post feedback from attendees of the workshops evidenced an overall increase in understanding and confidence about the topic, stating the following as the most useful aspects of the sessions: explaining how NDIS works, understanding the difficulties associated with Planning NDIS for people with CCN and how to begin the process of NDIS planning to ensure the plan is suited to a child, how to proceed with moving forward to develop more communication abilities, available resources and links, and learning ways to effectively use AAC. 4. Resource Development: Complex Communication Needs Resource Series co-developed with Merger of Minds. The series includes twelve topics: What is Money?, What can the NDIS do?, Things I like, I like to do activities, What are Goals?, Choice, I like to do something, Our goals, I like to know about days and times, What are complex communication needs?, CCN and the NDIS workshop presentation, I like different types of transport, The communication bill of rights, and the ASHA Communication bill of rights. Consultation with the Merger group during this project determined ‘Readers’ to be the most accessible information format for people with CCN. This model was developed by the Centre for Literacy and Disability Studies at the University of North Carolina (Readers are books which can be paper based or online, and include one or more photos per page to communicate the message). The NDIS Readers explore: what the NDIS is about and can do, what goals are, the language of planning and life stages in which people with CCN may like to make NDIS and/or personal goals. Resources will be available on the DDWA website, and uploaded to the Tarheel Reader website to ensure accessibility on any technology (computers, tablets, smartphones etc). Additionally DDWA has converted some of the readers into card sets which can be used with a Talking Mat approach to explore areas people with complex needs might be interested in including in their NDIS plans. A multimedia presentation on Complex Communication Needs has been recorded and is available on YouTube. Formation of the DDWA CCN families Facebook group-a closed group of 47 members from around the state. DDWA continue to moderate this page and provide updates with information about CCN and upcoming events. Many of these families reported feeling very isolated and unaware of progress being made in this field and now have a point of connection. There is a need for explicit NDIS planning related language and also planning processes themselves to be embedded in AAC systems. 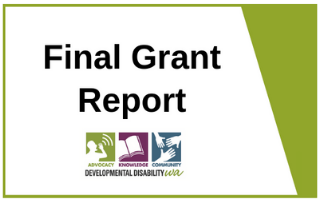 There is generally inadequate NDIS funding to support the target group to access the level of support necessary to achieve success. There is a need for NDIS Planners to understand that the technical requirements of supporting people with complex needs require a therapy team approach –including Speech therapy, Occupational Therapy and Physiotherapy to address access and sensory needs which can be barriers to access, and physiotherapists for positioning. The group consistently felt that 30 hours of support from a suitably qualified and experienced professional would be the minimum required to get to ‘first base NDIS readiness’ – i.e. to be prescribed a suitable device, and for the person’s networks to be educated and supported in how to use it to model language. Most NDIS plans allow for 10 hours.